The Marine Mammal Center : 10,000th Sea Lion Named Milestone Admitted! 10,000th Sea Lion Named Milestone Admitted! 10,000th California sea lion rescued has a name! "Milestone" is the 10,000th sea lion to be rescued by The Marine Mammal Center since 1975! More than 1,000 name submissions were submitted within the past few days to help us name our 10,000th sea lion patient! It was an incredible response with many unique name ideas such as Decamille, Maximus, Atlantis, Banana Slug, and Senior Lobo - just to name a few! We thank everyone who participated and even though only one name can be chosen, you've given our team some great ideas for future patient names! The name of our 10,000th sea lion patient is: Milestone! Milstone continues to respond positively to the antibiotics he's on that will hopefully clear up the bacterial infection that made him ill. He's eating just over 8 lbs of fish a day and is quite feisty - a good sign of improving health! We've recently rescued our 10,000th California sea lion and we’re inviting you to help us name our newest patient! This juvenile, male California sea lion was rescued on a dock in Santa Cruz near the famous Santa Cruz Beach Boardwalk. He had been hanging out on this particular dock for at least three days. Each day, volunteers from the Center kept an eye on him to see if he would eventually leave on his own to forage. It is common for sea lions to "haul out" of the water and onto land or docks to rest and sun themselves. Rescuers didn't want to disturb what might have been a natural behavior for this animal, so kept an eye on him instead. It was a good thing they did because unfortunately this sea lion was indeed ill, and on day three, with people getting too close to him it became apparent that he was listless and not behaving like a normal wild animal. On Friday, volunteer Doug Ross rescued the sea lion, and other volunteers from our Monterey Bay Operations assisted in transporting him up north to Sausalito. Shortly, upon arrival at the hospital in Sausalito, veterinarians gave the sea lion a full admit exam and determined a working diagnosis of leptospirosis - a bacterial infection that results in kidney disease and can be deadly for sea lions if not treated early on. Currently, the 111 lb pinniped is resting, eating well, and veterinarians have him on antibiotics. The rescue of this sea lion, as well as all of our patients, is an amazing achievement and signifies the dedication and commitment we have to helping these animals and giving them a second chance at life. But, it's also a sobering message about the health of our oceans and the role we all can play in making their home, the worlds' largest life source, a healthier and safer place to live. 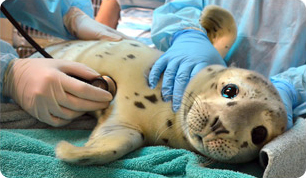 Volunteers and staff rescue hundreds of animals each year, and since our humble beginnings in 1975, we’ve rescued over 16,500 seals, sea lions, otters and other marine mammals. These animals wash up on beaches along 600 miles of northern and central California coastline for many reasons including malnutrition, entanglement in ocean trash and illnesses such as toxic algae poisoning and bacterial infections. While at our hospital, these animals receive the medical care they need and everyone works together with the goal of getting each patient healthy and ready to return to their ocean home. In addition, veterinarians learn incredible information about marine mammal health that can be used to help endangered species like the Hawaiian monk seal.